Up to $300 (or more for exhibitors) in savings on registration for the annual IPMI Conference & Expo, with the largest number of attendees, exhibitors, and educational sessions in the industry! 30 percent discount on monthly webinars led by the parking profession’s leading experts. 25 percent discounts on the industry’s best online training courses. 40-50 percent discount on fees related to Accredited Parking Organization (APO) certification for organizations. 30 percent discount on fees related to CAPP certification for individuals. Deep discounts on customized on-site training and professional development. IPMI Membership Directory—online and searchable. Engage with one of IPMI’s Committees. Access to the members-only community, Forum. 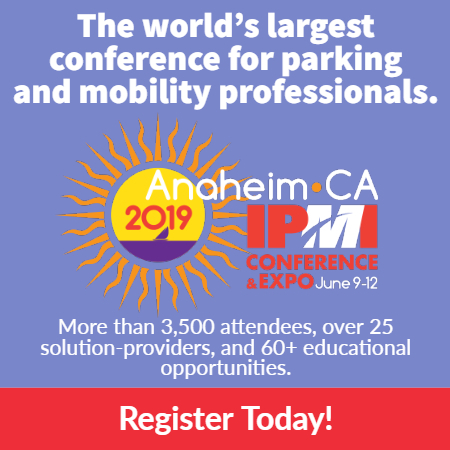 IPMI Conference & Expo (June 9 – 12, 2019 in Anaheim, California). Insights and data from the international community through IPMI’s leadership in Global Parking Association Leaders (GPALs). Discounts on registration at IPMI International Conferences in Latin and South America, and coming soon, China. Opportunity to meet and mingle with parking professionals from more than 35 countries at the IPMI Conference & Expo and throughout the year. Access to IPMI’s award-winning The Parking Professional monthly magazine—up to four paper copies of magazine and unlimited access to digital edition for entire staff (non-members are limited to archived issues). Ability to review and post Request for Proposals (RFPs). Buyers Guide & Consultants Directory. Career HQ. Post a job. Find a job. All new postings are shared to IPMI’s Facebook and Twitter pages. Industria del Estacionamiento, a semi-annual, Spanish-language magazine focused on the parking industry in Mexico and Latin America. The Blog, a robust daily forum for reading, posting, and commenting. Member contributions welcome! Consumer-specific public service content, campaigns, templates, and collateral to enhance your community outreach efforts. Publications, white papers, and resources that help in your day-to-day operations, such as A Guide to Parking, Emergency Preparedness Guidelines, Glossary of Parking Technology Terms, Why Parking Matters®, Emerging Trends in Parking, Suicide in Parking Facilities: Prevention, Response, and Recovery, and more. IPMI Member News. Read and post the latest news about parking people, products, and services on the home page of the IPMI website; members can submit news that is also shared in the IPMInsider.